Hello friends, I am up with a very simple card. I bought the Newton's Nook stamps, when I was in HK a few days back. This is my first ever set, glad that I can finally buy it here. 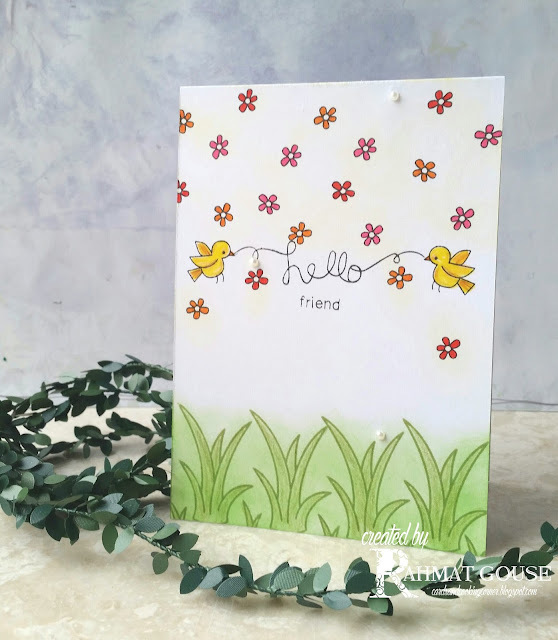 It is a one layer card, I started with stamping the hello first from winged wishes set, then the remaining sentiment, and then the birds, followed by the tiny flowers. All these are outline stamps and are colored using markers and pencils. The leaves on the bottom are from Lawn Fawn. I decided to sponge green at the bottom, and then colored the leaves. I also sponged yellow, very lightly around the flowers, a few pearls to finish off. Adorable! Love the little birdies holding the string-like sentiment! So cute! Oh my!! How sweet are those birdies holding your sentiment!! Dainty and delicate looking card. Love it. Thank you so much for joining in Simon Says Stamp Anything Goes Challenge. Adorable Card! I love the sky filled with flowers! 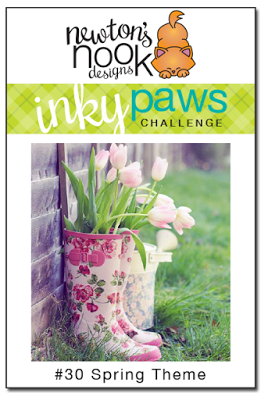 Glad you were able to find our stamps and so happy that you linked up to our inky Paws Challenge!